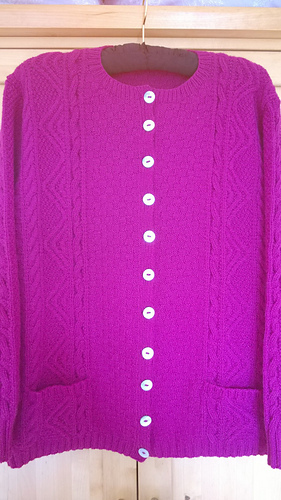 The Puzzle Cardigan features a cable/texture pattern in a simple cardigan silhouette with crew neck, set-in sleeves and set-in pockets. 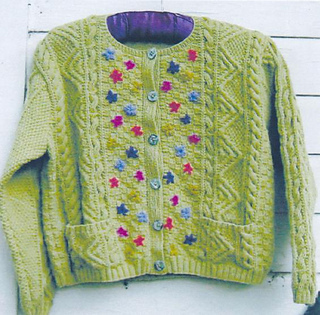 Embroidered flowers across the centre front of the cardigan are optional. Tension/gauge: over checker pattern at centre front: 21 sts and 32 rows to 7.5 cm (3 inches). Yarn required: either 8 x 50g balls of Lambswool No 1 or 9 x 50g balls of Fine Cotton.